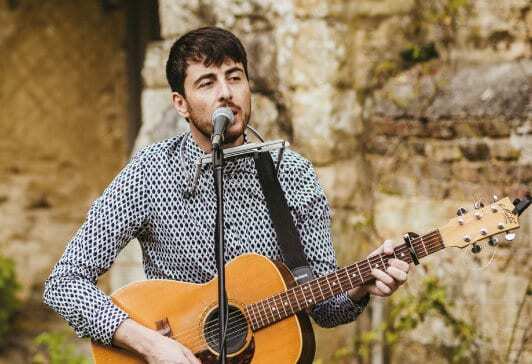 Offering full day Wedding Entertainment packages; Michaels acoustic sets are brilliantly tailored to give a diverse live performance that is suitable for many parts of your wedding day; From laid back popular acoustic covers during the Ceremony or Drinks reception, to upbeat, foot stomping, Harmonica blowing sing-along sets in the evening. If you are looking for a Wedding DJ in Derbyshire, Michael offers an optional DJ service to keep you and your guests on the dance floor until the end of the night. Michael has developed a great repertoire of over 200 songs which he approaches with his unique personal style – adding harmonica and stomp box to complete his one-man band sound. Specific songs can be requested and Michael is more than happy to make special arrangements. Available with his own PA system & lighting, he can play in almost any space whether small or large, indoor or outdoor. As guests arrive, walking down the aisle, during the signing of the register, walking back up the aisle. Background acoustic music inside or outside as everyone is welcomed with drinks after the ceremony. Create the perfect ambience whilst you and your guests are eating. Create your own customizable wedding entertainment package by choosing live acoustic sets across different parts of your day!